Mi360 is Ready for YOU! 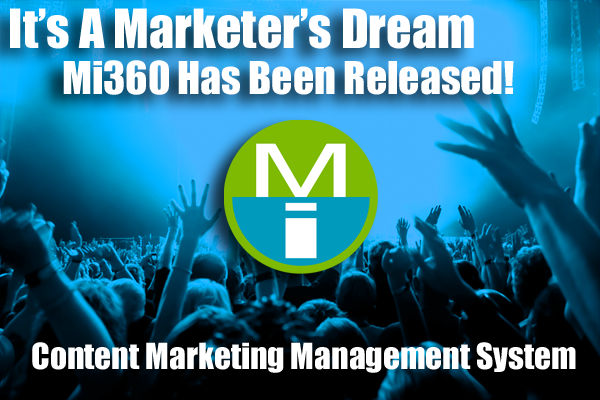 Today we’re proud to announce that our digital marketing technology partner, Massive Impressions, is releasing to the public our secret weapon – Mi360. We’ve been using this proprietary content marketing & social media management tool for over a year with our clients and all we can say is WOW it’s a marketer’s dream. In support of our partner, we’re ready to let marketers like you take advantage of it too. Up to now we’ve been using our secret weapon exclusively in-house. We’ve improved and refined it for years. Now it’s ready for you to use. It’s time to get your heads out of the sand and face facts. Social Media is no man’s island. Simply re-posting third party content to make your company look smart, or making statements with no inbound links to your website just doesn’t cut it anymore. Content must be engaging, grow audiences organically, start conversations AND link back to your website. What Will Marketing Look Like In The Next 100 years? The Secret To Social Marketing: Lessons From An Early Morning Spin Class. Baby Boomers, Gen X, Millenniums —Why Good Marketing Departments Need Them All! Captivating Your Social Audience: Lessons From A Subway Ride.